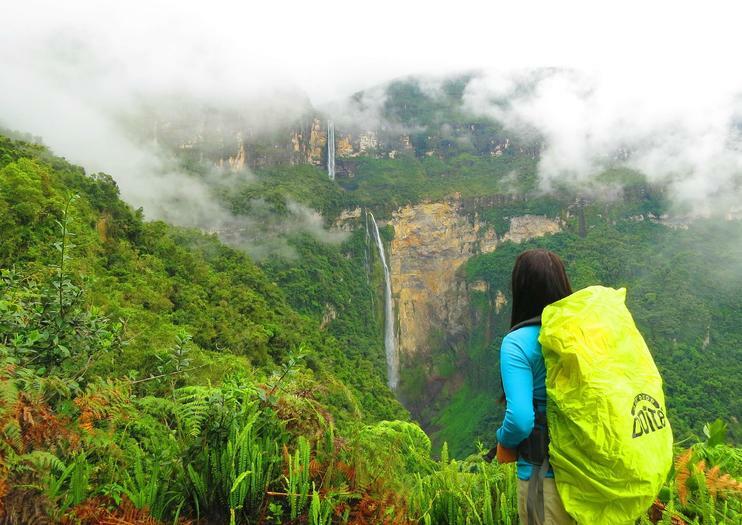 In the upper Amazon basin, in the heart of the Chachapoyas region, the bi-level Gocta Waterfalls tumble from a dizzying height of 2,529 feet (771 meters). They are approachable by hiking or horseback riding. Known only to locals until 2002 when a German explorer discovered it, the falls are a relatively new attraction for visitors to Peru. Adventurers can spend an afternoon navigating the network of wooded trails winding from the village of Cocachimba through the forest valley Gocta Waterfalls. The hike can be strenuous, so some travelers opt to make the journey on horseback. Either way, visitors are rewarded with views of a natural rock amphitheater hugging the pool at the bottom of the falls—a natural setting for the explosive crash and spray of water from the falls. The hike to the falls is suitable for solo travelers, couples, families, but hikers should be in good physical condition. There are small operators offering guides, horse riding excursions, and camping gear rentals. Admission fee is about $3 for adults, about $1.50 for children. Bring cash in small bills or change. Wear proper hiking shoes and clothing for the hike or horseback ride, and bring swimwear and a towel to enjoy the pools and falls. The round-trip trek takes about six hours. From Lima, fly to Chachapoyas and take a taxi or drive about 1.5 hours to Caseríos of Cocachimba where a well-kept jungle trail begins. Opt to join a tour or hike alone for about three hours to reach the pool below the waterfall. Along the trail, 22 waterfalls create a water parade before reaching the main event. During the rainy season, between November and April, the falls are bigger. Since the falls feed from the Andes, and the climate is relatively consistent year-round, water always descends and any time of year is a good to visit. For centuries, locals have known and revered the falls they call La Chorrera (“drainpipe”), but they were unknown to the modern world until Stefan Ziemendorf, from Germany, stumbled upon them in 2002 while looking for a sarcophagi located on the other side of the Utcubamba Valley. Until tourism came to the falls, locals kept away due to superstition surrounding the falls.